Maidstone is found just outside of London in neighbouring Kent, often referred to as the Garden of Eden. 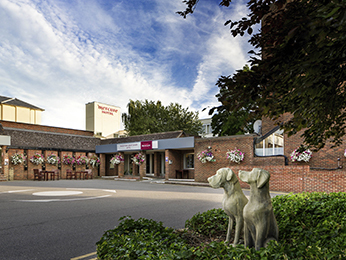 Make the most of your visit by taking your pick from our selection of hotels in Maidstone below. The River Medway runs through the idyllic town and historically was the source of much of the town's trade. A number of historic buildings lie in Maidstone, including Leeds Castle, built in the early 12th Century and at one time the residence of King Henry VIII's first wife Catherine of Aragon. Alternatively, Stoneacre is a half-timbered 15th Century Yeoman's house, now a National Trust property that is open to the public on Saturdays and Bank Holiday Mondays between March and September. Also in Maidstone you will find Archbishop's Palace, a 14th Century building which is today used by Kent County Council as a register office. In a county known for its natural beauty, Kent Downs is a highlight of the region, occupying a wide, green area of unspoilt space, making a wonderful place to visit if you're looking for an afternoon away from distractions. The M20 motorway just outside of Maidstone leads south to Dover, allowing for easy access to France and Europe, or alternatively the town is within reasonable distance of London. Booking a hotel in Maidstone couldn't be easier. Simply browse our selection of hotels below and choose one that best suits your needs. Booking online with AccorHotels offers a host of benefits, including our Best Price Guarantee and last minute and real-time room availability.